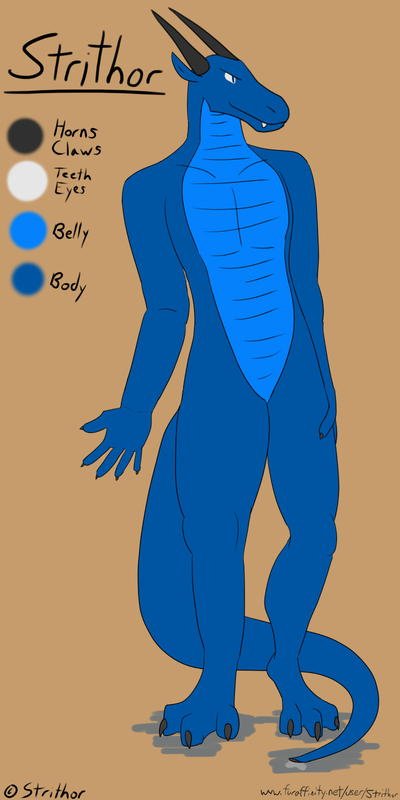 Strithor is a male anthro blue dragon who stands just over 6 feet tall and is of the wingless variety of his species. He has an average body type, lacking the muscularity many of his kind boast. Other than the two dark horns extending from his head, a long black tongue, and two nibblable ears, this dragon has no real distinguishing 'facial' features. His scales are a beautiful shade of blue, while his chest and belly are covered in a slightly lighter shade. He has hands that can easily be considered human-like while standing on semi-digigrade feet, which are supported by three plump toes each, all of his digits ending in short and harmless claws.